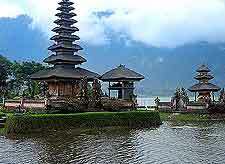 Bali, Indonesia's top tourist attraction, is home to nearly all of the country's minority Hindu population. Its incredibly rich culture, spirituality and traditions of art, music and dance stem from the ancient history of Bali. People have been living on the island for at least 4,000 years, while its unique civilisation began taking on its current form 2,000 years ago. Although many of the cultural and religious traditions can be traced back as far as the 1st century AD, the island really began to develop its rich heritage of Hindu-based culture during the Majapahit Empire (1293 to 1520 AD). When the Balinese king was conquered by the Javanese king in 1343, the Majapahit Empire established a capital here, first at Samprangan (Samplangan) and then at Gelgel. The Majapahit brought their Hindu-Javanese traditions of architecture, theatre, literature, dance, painting, music and sculpture to Bali during this golden era of culture. This legacy continues today as the foundation of Balinese arts, evident in original forms like 'wayang' puppet shows and the Kawi script. When the Majapahit Empire began to decline in the 15th century, there was a major exodus of Javanese artists, priests, craftsmen and intellectuals, who decided to move here from Java. As Islam continued to rise throughout the archipelago of Indonesia, the mighty empire of the Majapahit collapsed and Bali gained independence from its Javanese masters in the early 16th century. However, the legacy of the Majapahit lingered on through the history of Bali for the next five centuries, with the cultural heart of the empire remaining here, despite the empire's reign having come to an end. Bali seems to have been lucky throughout the European colonisation efforts in Indonesia, as it was largely ignored in favour of Java and other larger islands. The Dutch made claims to the island in the 1600s, but were greeted with hostility by Balinese kings and decided to leave trade in Bali to others like the Arabs and the Chinese. The 1600s were a rough time for Balinese society, as local kings were being wooed by the Dutch and Javanese sultans alike. By 1651, the Gelgel kingdom, Bali's most powerful polity at the time, fractured into nine separate smaller kingdoms. They all deferred to the main royal seat in Klungkung, but fought continual battles among themselves over the next century. During the 18th century, the French, the Dutch and the British all tried and failed to established treaties with the Balinese kings. By the 19th century, the Dutch colonial campaign stretched across most of the Indonesian archipelago and Bali could not escape its roving eye. Three military campaigns into northern Bali, between 1846 and 1849, placed the Dutch in the driving seat of Bali's history. However, the Balinese kings never accepted occupation, and strife was the order of the day for the following decades. The Dutch interventions of 1906 and 1908 were examples of how the Dutch dealt with royal rebellion. More massacres than interventions, these events saw the Dutch kill off two royal houses and hundreds of locals, under the pretext that the Balinese were plundering shipwrecks off their coast. Perhaps the most significant event during this period was the suicidal 'puputan' (fight to the death), where the royal households presented themselves to the invading Dutch officers and promptly committed mass suicide. It gained them considerable sympathy among the common Dutch folk back home and eventually changed the course of foreign policy in the Netherlands. When Indonesian independence was declared in 1950, Bali was caught up in the purge of Suharto's New Order military government. It is approximated that some 80,000 Balinese (roughly five percent of the population) were executed during this era. When the Mount Agung volcano erupted in 1963, it added further woe to the island, killing thousands and displacing many more. Fortunately, rather than destroy the island's unique history and culture, the Suharto regime saw the merits in opening up the island for tourism. 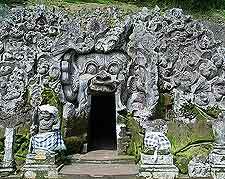 While tourism has been an economic boon for Bali, it has also deteriorated the ancient heritage to some degree. Militant Islamists have used Bali as a staging area against western ideology in recent years, with the 2002 bombing in Kuta killing 202 tourists and a further bombing in 2005 affecting tourism.